Fitting for any steakhouse, grill house or steak restaurant, Amigos Galician fillet steaks are becoming the talk of Benidorm. In an October 2015 article in the Guardian newspaper, Ed Cummings wrote... "Over the past year, beef from northern Spain has become the must-order dish in many top London restaurants and won the kind of fans restaurateurs dream about. Nigel Slater raved about the Galician beef he was served at Kitty Fisher’s in Mayfair: “Awesome. Totally awesome,” he tweeted. Zoe Williams in the Telegraph said it was good enough to turn you into a “beef nerd”. At Chiltern Firehouse, in Marylebone, Galician fillets fly off shelves into the mouths of celebrities..."
Although I can't promise that our Galician steaks come from the same retired old cows Nigel Slater raves about, I can promise you that they come from the same area in Northern Spain and are among the best you will find anywhere. What we have done is try to serve them in a unique way whilst at the same time, keeping the dietry needs of the coeliac in mind. We believe you won't find a better steak in Benidorm. A gluten free option, the Galician fillet steak tower is unique to Amigos and is the most popular dish on the whole menu. A roasted red pepper stacked with sweet potato mash, garlic spinach, fillet steak, caramelized red onion and crumbled blue cheese... (or cheese of your choice). 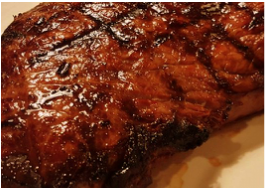 The steak can also be substituted for the less expensive options of chicken, salmon or vegetables giving plenty of choice for all. Our chef's signature dish and her own rendition of Surf and Turf. Galician fillet steak cooked in a home made pepper sauce served with Atlantic prawn and fresh mussels. Another gluten free option. A Galician fillet steak served with a whisky and mushroom sauce and a shot of Jack Daniels whisky. Which, is to drink, not pour over the steak. This gluten free Galician fillet steak is pre-order only. Marinated in tequila, lime and coriander it is served with a shot of Tequila. Served with peppercorn, garlic butter or blue cheese sauce . 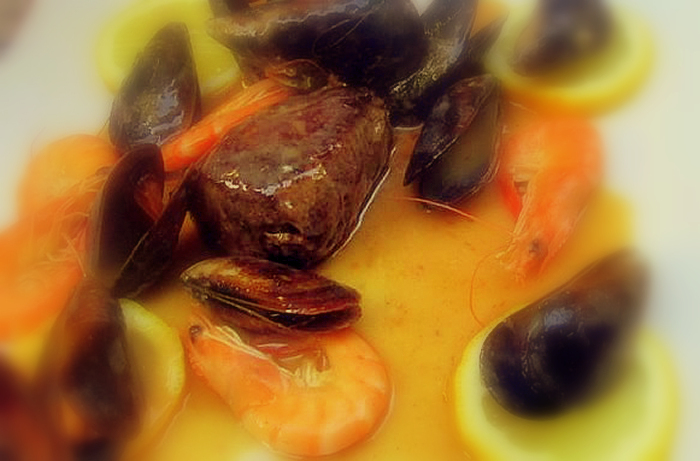 Fillet steak cooked in a pepper sauce served with Atlantic prawn and fresh mussels. Steak with a creamy stroganoff sauce. Please ask our server what the special is on the night. Prices for these premium Galician fillet steaks range between 22 and 42 Euros varying by weight 6oz - 12oz and variety. Please ask server.